Under Kevin Cash’s direction, the 2018 Rays went 90-72—the most wins in baseball by any team missing the postseason, and their best record since 2013. 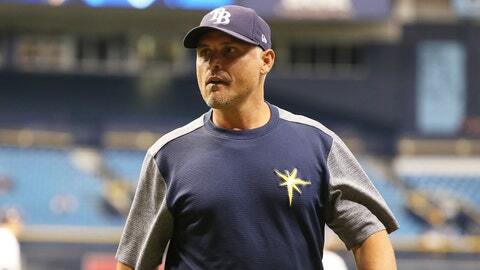 ST. PETERSBURG, Fla. (AP) — The Tampa Bay Rays, who won more games than any American League team that didn’t make the playoffs, have rewarded manager Kevin Cash with a contract extension that runs through 2024, plus a club option for 2025. “There’s reason to be really excited about the way our team played, the youth and the athleticism, and the way these guys really came together in the second half of the year,” Cash said. With first-time All-Star Blake Snell leading the majors with 21 wins and an AL-best 1.89 ERA and Cash overseeing an innovative plan to use “openers” and “bullpen days” to compensate for a shortage of proven starting pitching, the Rays went 41-25 after the All-Star break, including 19-9 in September. “This is a year we put a lot on his plate,” Neander said. “We made a lot of moves all the way into spring training that left a lot of doubt, potentially within our clubhouse with respect to what we could accomplish this year. “To see him navigate that, to see him navigate the difficult stretch we had out of the gates, the maturity, his approach, the unwavering support he had from our coaching staff … was really impactful” and makes Cash the right man for the job “not only today, but for the forseeable future,” the GM added. Cash doesn’t anticipate the extension creating additional pressure because expectations have remained consistent for an organization that made the playoffs four times in six seasons from 2008 to 2013.